New PowerVolt BVA-7DS8 6.3-7 VDC 8 Amp Regulated Open Frame Power Supply. Ideal For critical Tube Gear application that require silent, precisely regulated heater current. New International Power IHB250-0.1 250VDC 100MA Linear Regulated Power Supply. New PowerVolt BVA-7CS6 6.3-7 VDC 6 Amp Linear Regulated Open Frame Power Supply. 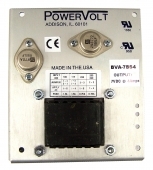 New PowerVolt BVA-7BS4 6.3-7 VDC 4 Amp Regulated Open Frame Power Supply. NIB Condor HB24-1.2-A 24VDC 1.2A Linear Regulated Power Supply For Neve Projects, Etc. New Power-One HCAA-60W-A 5VDC And Bipolar 12 or 15 VDC Linear Power Supply. Lambda LDS-Y-48 48 VDC 1.3A Linear Regulator Power Supply, Works Great. Used Lambda LDS-Y-01 0-7 VDC 3.4A Linear Regulator Power Supply, Works Great. New In Box Unused Power-One HB200-109 150VDC 120 MA Linear Regulated Power Supply.